Just like Led Zeppelin’s Stairway to Heaven and Queen’s Brighton Rock, this week’s suggestion was an album track which became so well-known that anyone would have thought it was their biggest hit. Its author had written a rock opera around three years earlier and was planning on following it up in 1971 with another, but it never came to fruition, but one of the tracks written for it became an everlasting legacy. The sequel was to be called Lifehouse and as Townshend explained, “The essence of the story-line was a kind a futuristic scene. It’s a fantasy set at a time when rock ‘n’ roll didn’t exist. The world was completely collapsing and the only experience that anybody ever had was through test tubes. In a way they lived as if they were in television programmes. Everything was programmed. The enemies were people who gave us entertainment intravenously, and the heroes were savages who’d kept rock ‘n’ roll as a primitive force and had gone to live with it in the woods. The story was about these two sides coming together and having a brief battle.” The project was never completed. Baba O’Riley, which was originally intended as the opening piece for that project, takes the first part of its title from Meher Baba – a spiritual leader who Townshend met in 1967. He was a self-declared Spiritual guru. He was born Merwan Sheriar Irani in Central India in 1894 and it is claimed that when he was around 19 he was kissed on his head by a holy woman which gave him a religious reality and so he began studying leaders and their experiences which led him to become more holy. By the age of 31 he took a vow of silence and began communicating by use of chalk and slate, two years later he gave up using the writing implement and began using a self-built alphabet board. He maintained that silence right up until his death in 1969. As for the second part, O’Riley came from the Californian-born composer Terry Riley who was a pioneer at the minimalist school of Western classical music and specialised in Indian classical music who Townshend admired and was a key influence on many of the keyboard riffs heard on the album Who’s Next. In the sleeve notes from that album, Townshend said he wrote it as his vision of what would happen if the spirit of Meher Baba was fed into a computer and transformed into music. 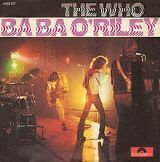 The result would be Baba in the style of Terry Riley, or Baba O’Riley, a title which is not mentioned in the song. The last minute and a quarter of the song features a violin which was played by Dave Arbus, a member of the group East of Eden who will always be remembered for their 1971 hit Jig-A-Jig. Arbus was good friends with the Who’s drummer Keith Moon and it was Moon’s idea to add the violin section. The song has had a fair amount of television exposure; the creators of the crime drama series CSI (Crime Scene Investigation) are clearly fans as they used a different Who song for each instalment. The original series in 2000 used Who Are You, CSI: Miami uses Won’t Get Fooled Again, CSI: NY in 2004 used Baba O’Riley and CSI: Cyber used the 1967 hit I Can See for Miles. It’s also appeared in a commercial for the Nissan Pathfinder. Pearl Jam have covered the track and regularly feature it in their live show and Mr Big recorded it on the b side to their 1992 hit To Be With You. I have got it on a CD single My Generation (CD Single)(Polydor POCD 907) … even then it’s relegated to track 3!